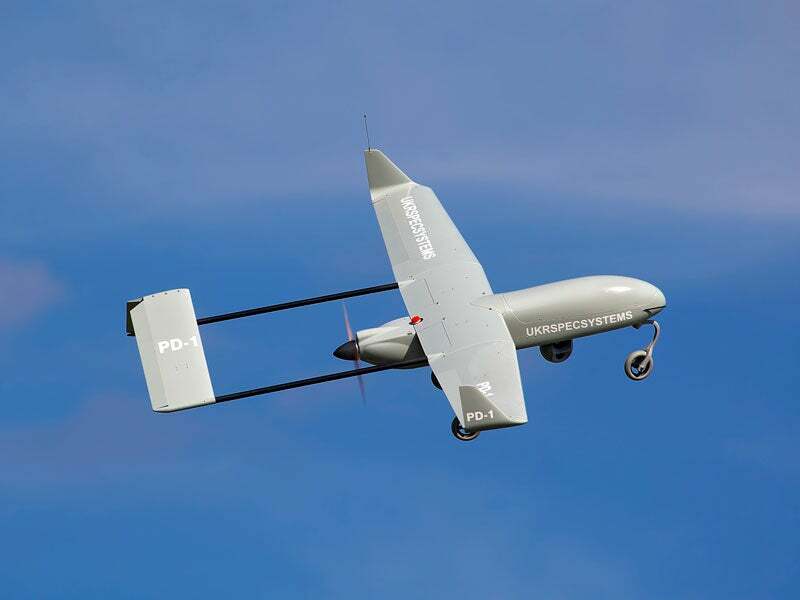 The PD-1 unmanned aerial system (UAS) is developed by UkrSpecSystems. Image courtesy of Ukrspecsystems. PD-1 UAV is equipped with gyro-stabilised high-definition EO/IR cameras. Image courtesy of Anpolimus. The People’s Drone PD-1 unmanned aerial system (UAS) is designed and manufactured by UkrSpecSystems, a UAS producer based in Ukraine. The drone was purchased by the Ukrainian Armed Forces in August 2016. The unmanned aerial vehicle (UAV) is designed for military and civilian missions such as aerial surveillance, observation, monitoring, intelligence, reconnaissance, and photomapping. The UAS was introduced at the X International Aviation and Space Salon AVIASVIT-XXI 2016 in October 2016. It was first unveiled to the public during the LIMA (Langkawi International Maritime and Aerospace Exhibition) exhibition in Langkawi, Malaysia, in March 2017. Featuring a modular airframe, the PD-1 UAS has a length of 2.54m, height of 0.99m and wingspan of 3.19m. Its maximum take-off weight and payload capacities are 33kg and 8kg respectively. The UAV features fixed-wing design with winglets angled upwards. Its tail section comprises two control surfaces arranged in inverted V-shape configuration, which reduces parasitic drag. The drone is equipped with a tri-cycle landing gear consisting of a single nose wheel in the front and a pair of two main gears under the fuselage. "The UAS was introduced at the X International Aviation and Space Salon AVIASVIT-XXI 2016 in October 2016." It can perform take-off in multiple ways, including an autonomous runway take-off, pneumatic catapult launcher, and car top launch. It can be landed either autonomously on runways or can be recovered using a parachute recovery system. The UAV’s modular airframe allows for integration of a variety payloads in order to meet different mission requirements. The basic version comes with USG-202 electro-optical/infrared (EO/IR) gimbal payload, consisting of a full high-definition 30x Sony EV7500 day camera and a high-quality thermal imaging camera. The EO/IR cameras allow for identification, detection and tracking of targets both during day and low-visibility conditions. Payload options for the PD-1 drone include USG-212 EO and IR multi-sensor gyro-stabilised gimbal and USG-211 gyro-stabilised gimbal, which features a high-performance Sony EV7520 camera and a video processing module. The PD-1 unmanned aerial vehicle can be flown in either pilot-assisted or fully autonomous modes. In the pilot-assisted mode, the operator at the ground control station sends mission planning and flight path to the UAV through data links. Housed in a rugged lightweight case, the ground control station features 1,000cd/m² high-definition screen, which displays telemetry data and video captured by sensors aboard the UAV. In autonomous mode of operation, the onboard autopilot allows the drone to fly autonomously from take-off to landing following a pre-defined flight path set by the operators. The flight path can be altered by the operators during the flight according to the mission needs. Autonomous emergency landing of the drone can be made in the event of loss of communication with the ground segment. The PD-1 receives commands and transmits telemetry data through an encrypted radio communication link over a range of 80km. An encrypted video downlink receiver allows for the transmission of 1,080px full high-definition video from the air to the ground segment in real-time. The onboard global navigation satellite system (GNSS) satellite system and an inertial navigation system (INS) provide navigation and positioning data for the drone. Powered by a single 50cc internal combustion engine, the PD-1 unmanned aerial vehicle can fly at speeds between 70km/h and 140km/h. Using A-95 gasoline mixed with oil, the engine drives a two-bladed propeller mounted in pusher configuration. The cruising and stall speeds of the UAV are 95km/h and 50km/h respectively. The UAV can reach up to a maximum altitude of 3,000m and execute missions for up to five hours. It is capable of operating under different weather conditions and withstanding temperatures ranging from -20°C to 45°C.